good closet composting isn’t only about finding the perfect closet and correctly mixing the contents in that closet. it’s also about what you add to the pile. step 1: choose the right size closet. the perfect size closet will help to regulate density and diversity of your compost. a good minimum size for a pile is at least 1 cubic yard or 1 cubic metre, though a pile can become much larger than this. step 3: layer or mix the different materials in your closet so that they come into contact with one another and so that you avoid any large clumps that can cause wrinkling. step 4: turn your pile regularly, once every week or two. clear a patch next to the closet. then use a pitchfork and move the entire pile to the clear spot. 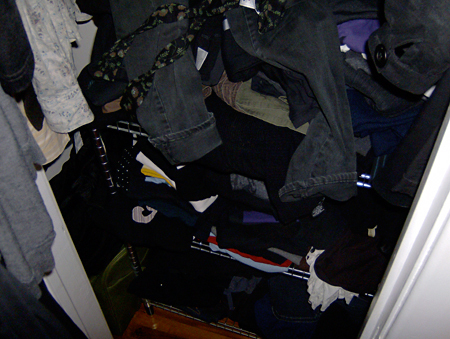 re-pile the clothing with the items formally on top now piled on the bottom. mixing the pile in this way helps to keep your wardrobe from becoming stale as you keep “recycling” items of clothing from top to bottom to top again. never add boots, shoes and other footwear to the pile. try to compost seasonally. winter compost for the colder months and summer compost for the warmer months. this will help you to avoid unnecessary rotation of items of clothing that are inappropriate for the current season. remember to harvest your compost from time to time. weed out the items you no longer feel you want or need (or fit!). this allows you to make room for newer items.